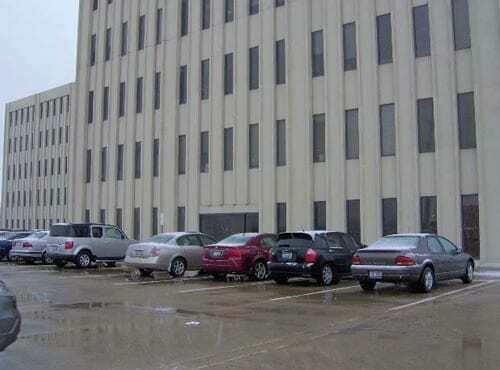 Orangewood Place is a 126,901 sf, Class B, multi-tenant office building on a 4.73 acre site in Beachwood, Ohio. The site is improved with parking, concrete walkways, a bright atrium lobby, three elevators, a restaurant, conference room, barber shop, and attractive landscaping. Beachwood is an easily accessible suburb of Cleveland located approximately 12.5 miles east of downtown, and less than 5 miles from the affluent suburb of Shaker Heights. Beachwood is considered to be one of the more desirable suburban office locations in the Cleveland metropolitan area. Orangewood Place is a 126,901 sf, Class B, multi-tenant office building on a 4.73 acre site in Beachwood, Ohio. The site is improved with parking, concrete walkways, a bright atrium lobby, three elevators, a restaurant, conference room, barber shop, and attractive landscaping. The Property enjoys good visibility from the adjoining highway system, and easy access to highways and local neighborhood services. The building is functional for healthcare providers and general office tenants. It has been well maintained and upgraded from time to time, with an attractive, bright atrium lobby and high quality interior finishes. The building floor plan can accommodate large and small tenant use, and there is convenient, on-site parking. Beachwood is an easily accessible suburb of Cleveland located approximately 12.5 miles east of downtown, and less than 5 miles from the affluent suburb of Shaker Heights. Beachwood is considered to be one of the more desirable suburban office locations in the Cleveland metropolitan area. It is in a middle and upper class neighborhood, with high-end retail shopping, expensive hotels, popular restaurants and a mix of commercial office, residential and industrial properties. Beachwood’s resident population of 12,200 people increases daily to an estimated 80,000 as workers and shoppers come into the area. Because of its location on the Cuyahoga River and Lake Erie, Cleveland was historically one of the nation’s manufacturing hubs. Today, it is the nation’s 33rd largest city and has a diversified economy focused on service-based industries. It is emerging as a leader in health care and health sciences, and is becoming a principal in biotechnology and fuel cell research. The outlook for the Cleveland real estate market, especially the Beachwood submarket, appears positive both in terms of its continued economic growth and stability. At closing, the Property will be approximately 94.17% occupied and gross rents will be approximately $1,841,280. The Property is located in an affluent suburb that is expected to have continued population growth and an increase in real estate values. 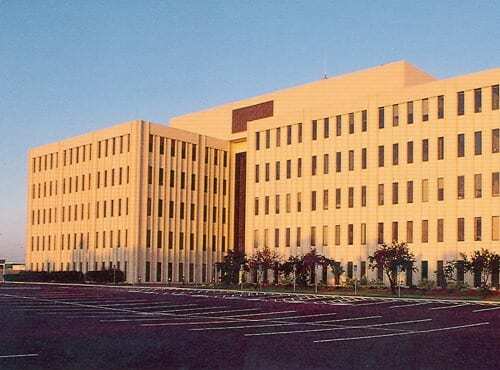 The Property is located in the Beachwood suburb of Cleveland, which has a current average vacancy rate of 10% for office space, with average asking rental rates of approximately $22.89 for Class A properties and $16.54 for Class B space. The overall Cleveland office market includes approximately 100 million sf of space, with a current market vacancy rate in the 13% – 15% range, and an average asking rental rate of approximately $17.25 for Class B space. Over the past two years, market conditions have improved at a steady pace, and there has been substantial office absorption in the most recent quarters. Current vacancy rates are the lowest since year-end 2001. Perhaps more than any other submarket, Beachwood’s lease rates favor the landlord, and the area appears to be poised for increasing occupancy and rental rates. 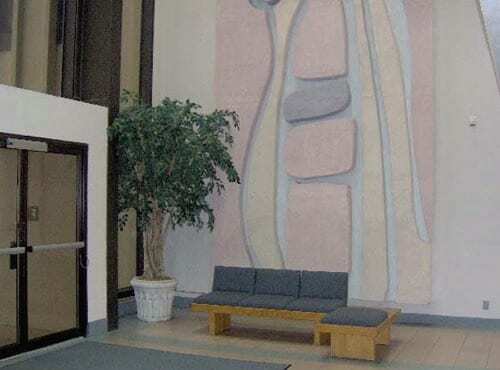 In particular, the healthcare industry is an important economic driver in the Beachwood and neighboring suburban markets and the Property is situated to gain from this environment. There is approximately 90,000 sf of new Class B construction in the Property’s immediate submarket; 88% of which is already preleased and is being marketed at $19.50 per sf. This is expected to put upward pressure on other rents in the submarket. The office outlook for 2007 seems favorable, with continued absorption in both Class A and Class B buildings expected to lead to rental increases, and decreases in concessions and incentives by landlords. Under a Confidential Private Placement Memorandum and Addendum dated September 30, 2007 (the “Memorandum”), BIG Orangewood Place Manager, LLC are offering tenancy-in-common (TIC) interests in the Property, and limited liability company units in an entity that will own a TIC interest. The offeror and the property management company are owned by BGK-Integrated Group, LLC, which is affiliated with the BGK Group of companies (“BGK”). Formed in 1991, BGK employs over 200 professionals and manages almost 18,000,000 square feet of commercial space. With over 2,500 investors, BGK has acquired more than 300 properties in more than 28 states. Well capitalized with over $75 Million in cash and cash equivalents and over $1 Billion in credit and mortgage facilities, BGK focuses on buying assets for below replacement cost in smaller markets. The TIC offeror will acquire at least a 2% interest in the Property and to better assure a timely closing, and will directly or indirectly acquire interests that are not sold to investors. The Property will continue to be operated by an experienced management team for a seamless transition in management with no “down time,” or disruption of leasing/tenant relations. The TIC offeror has also arranged a $300,000 credit facility for certain future leasing costs, if needed and approved by the tenants in common. Our objective is to increase the Property’s net operating income, while seeking appreciation as the local economy expands. That expansion is projected to tighten the office market, with higher rents and lower leasing costs. Priced below replacement cost, and given its size and location, we believe the Property is positioned to maintain a competitive edge in its marketplace. Management will seek to renew key tenant leases and seek new tenants as space becomes available. Management will also seek to recapture portions of the TFM Lease premises in order to enter into new leases with third party tenants at more favorable effective net rentals. 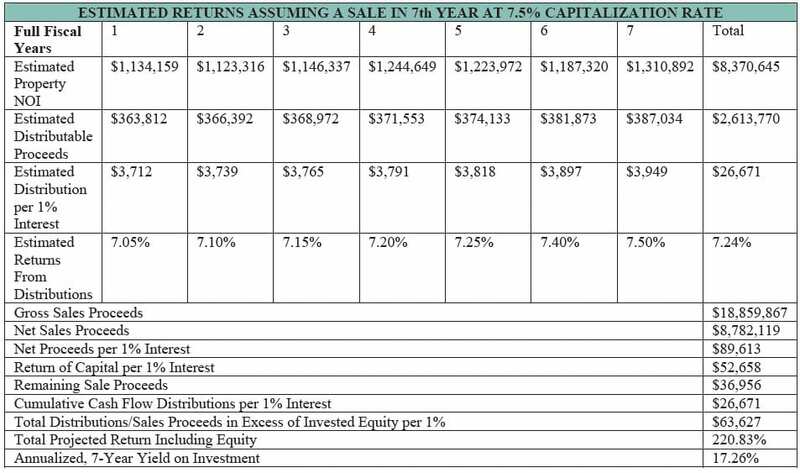 A Property sale is projected in 7 to 10 years, and the following table reflects a projected sale in the 7th year. All financial information therein is based on the assumptions set out in the Memorandum and includes forward looking statements. There is no guaranty or certainty that the projected results will be achieved.